Thank you to Private Collectors of Heritage Fruit Trees! THE FOLLOWING PEOPLE HAVE GENEROUSLY DONATED SCION WOOD FROM THESE PRECIOUS TREES, TO BE DISTRIBUTED AMONG THE GARDENERS OF AUSTRALIA. Peter Frost has maintained the fig varieties that were removed from the government collection in Bathurst some 20 years ago and shares cuttings around each year. Unfortunately some have lost their tags but there are some great figs in his collection and cuttings will available while numbers last at the grafting days I'm attending. Peter is seen here with a contraption he made up to lift logs off the ground so he can cut them with a chainsaw and keep the chain out of the dirt, it also pulls out steel posts. Peter and Wendy grow most of their own food in a very productive garden and Peter was one of the grafters at the first grafting day in Briagolong some 25 or so years ago, thanks for his support over the years with sharing many different varieties of plants. Thanks to Paul and Colleen Geysen of Boisdale, they started a collection of heritage apples perhaps five years ago and have been supporting our grafting days with scion ever since. I collected scion from around 70 varieties of apples and a few nashis before running out of time on Sunday. They have a dam above the orchard and it is watered by gravity, they live off the grid with alternate power, grow a lot of their on food, including all their own meat, part from their Wiltshire Horn sheep and part from their own beef. They get a lot of pleasure from sharing their varieties around and helping people live more sustainably and I'm always made very welcome. Their orchard rows are laid out on the contour and numbered A to somewhere like K with the row identifying letter on the post at the end. Each tree was tagged and I was let loose with a very easy list to follow. We have fantastic support from a few people with large collections of fruit trees that make our grafting days a great success and we also get some support from people with a much lesser number of varieties and it all adds up. Our first scion for the year came from Phil Brown, all beautifully prepared who said he only had the common varieties. One of the pears he gave us a lot of scion from was either Winter Nellis or Winter Cole (have to work from memory) and both are in our group but not enough for scion this year. Also we have are organising the first of possibly more grafting days to give bushfire affected people free fruit trees and need a good supply of the more common varieties. People don't realise how much it helps to have additions to our collection such as this so thanks Phil. 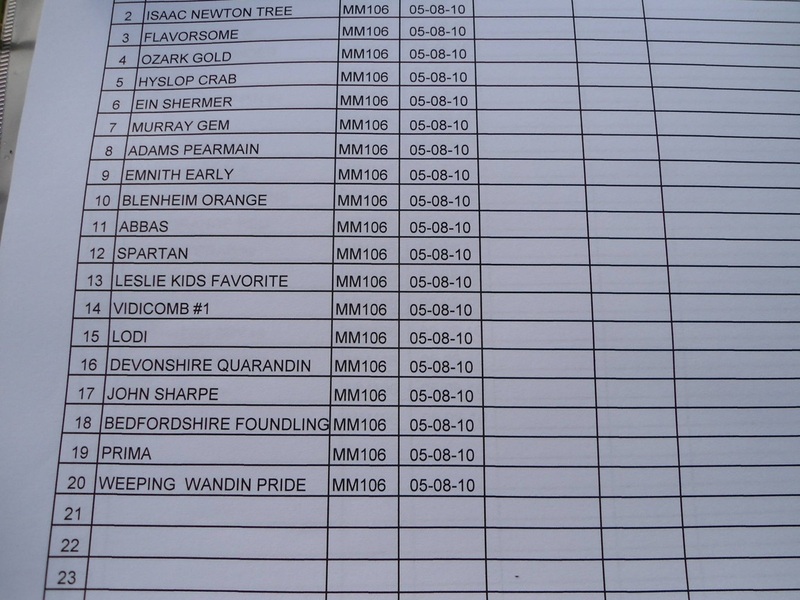 Please feel free to message me your email address and I will send you a list of what we have so far and if you have varieties not on it scion would be most welcome. Tim Friedrich has been a friend since we worked together on the asparagus around 1994 and spent around 10 years working in the plantations of a winter. Tim has followed the seasonal work a lot of his life and some 7 or 8 years ago went cherry picking north east of Melbourne and teamed up with another friend of mine, Russell, who had moved there from Maffra and bought a cherry orchard, both battlers. Tim started grafting his own cherries the following winter and hopes to have the trees netted this year to get his first return. He sells the cherries from the roadside park at Rosedale. We have some 17 varieties of cherry for our grafting days thanks to Tim always waiting till we get the scion before he starts pruning. Went to the Toora Heritage Pear Orchard yesterday and we now have some 50+ pear varieties for our grafting days thanks to their generosity. 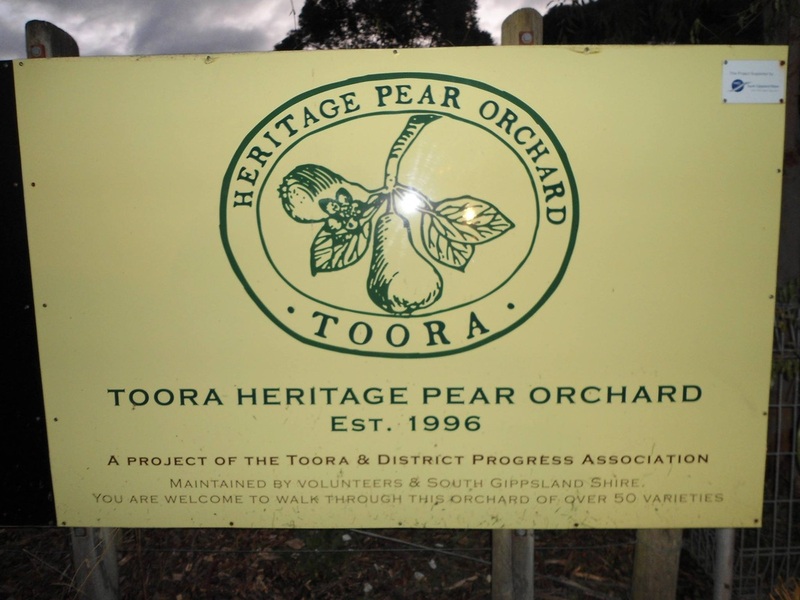 The orchard was established on public land in Toora in 1996 and is managed by a small very dedicated group, lead by Meryl Agars. Mostly for the last 5 or so years they have had a very good grafting day but have had to cancel it this year because of a few health issues have compounded the problems of too few people involved and they aren't getting any younger. This is a fantastic project and needs more younger people to get involved. If anyone would like to be involved message me and I'll pass on the contact details if you don't already have it. 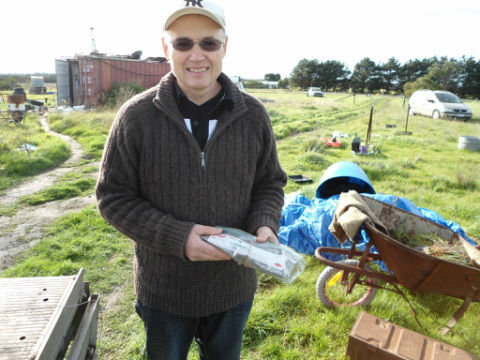 Another of the stalwarts of the grafting days over the years, my brother Ralph Barraclough from Licola. Ralph has been involved from the very start and has his 100 odd apples and lots of plums and a good variety of everything else. Living on the property the family moved to in the early sixties, he is standing beside a plum Dad budded when we moved there. Dad propagated many of the trees in the orchard from the best ones in the district and was self taught. Ralph moved back around 30 years ago and collected scion from all the best fruit trees in the many old orchards in the Macalister Valley and many of the original trees have since died of old age or were burnt in the fire of 2006-7, the varieties still survive through his efforts and are part of an excellent collection. 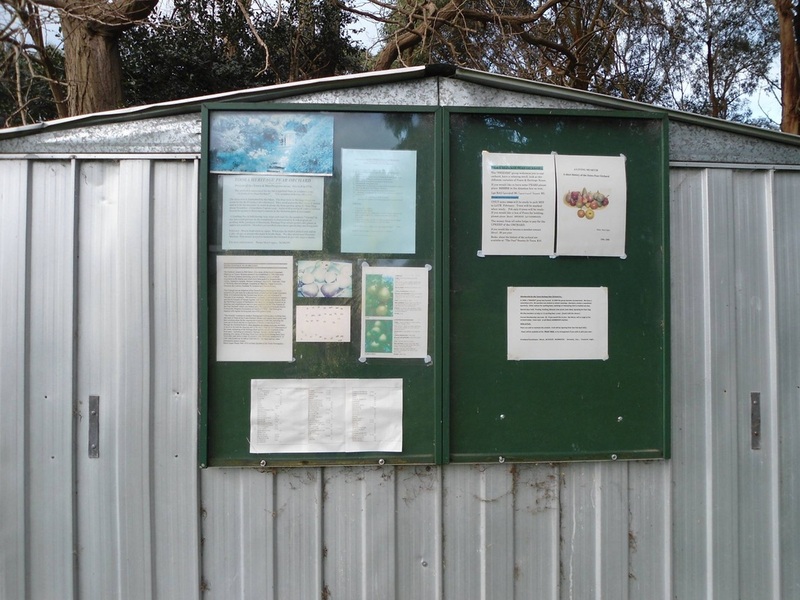 He has added the best roadside seedlings to his collections, varieties from the grafting days many parts of Gippsland. Just a couple of examples, one now known as the Christmas Apple, originally growing at an abandoned house site in Stockdale that ripens by Christmas day and is a good apple, the only one we now know of is one of his multigrafts that is being shared around this year and hopefully will be multiplied. Another is the Higgins Seedling, a seedling with apples like Granny Smiths but the tree is far better adapted to our climate that the Granny from Sydney and also a less vigorous grower so often more suited to multigrafts than the Granny that usually takes over the tree. Every year since we started Ralph has been incredibly supportive.